MULTIFOCAL GLIOBLASTOMA MULTIFORME PRECEDED BY A GEMISTOCYTIC ASTROCYTOMA AND DYSREGULATED IMMUNE RESPONSE. Ilian Koev1 , Emil Slavov2, Hristo Zhelyazkov1,3, Dmitrii Staikov4, Krasimira Halacheva2, Victoria Sarafian5. 5) Department of Medical Biology, Medical Faculty, Medical University - Plovdiv, Bulgaria. Glioblastoma multiforme (GBM) is known to be the most common malignant form of astroglial brain tumors. The etiology, cellular and molecular pathogenic mechanisms remain unclear to a great extent. Recent research indicates the role of the immune system in malignant glioma and especially in triggering the mechanisms of local resistance and systemic immune suppression. There is accumulating evidence that the concept of the CNS as an immune-privileged organ is no longer valid. Recent advances demonstrate that it is an immunologically active site, with complex immune responses mostly based on innate immune processes. Multifocal gliomas with varying histopathological appearance are extremely rare. We report the only case of GBM preceded by a gemistocytic astrocytoma with a very short survival time of just 3 months after the onset of complaints. Interestingly, a normal CD4/CD8 ratio but prominent change in the regulatory T cell lineage was recorded. The elevation of the suppressor CD8+CD11b+ cells and the reduction of cytotoxic CD8+CD11b- cells indicate the prevalence of a suppressor phenotype which provides an explanation for the occurrence of the second malignant tumor, the rapid tumor progression and fatal outcome. Koev I, Slavov E, Zhelyazkov H, Staikov D, Halacheva K, Sarafian V. MULTIFOCAL GLIOBLASTOMA MULTIFORME PRECEDED BY A GEMISTOCYTIC ASTROCYTOMA AND DYSREGULATED IMMUNE RESPONSE. J of IMAB. 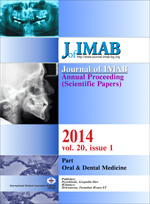 2014 Jan-Jun;20(2):502-505. doi: 10.5272/jimab.2014202.502.